Pete Burrell retires as managing director of Exodus this month, after 30 years with the company and recently winning a Contribution to Adventure Travel award. He talks exclusively to Pippa Jacks about the highlights of his career, and why agents should tap into the adventure sector. “We’ve certainly branched out a lot since the early days, but we’ve always stuck to the same philosophy. It’s about the experience first and foremost, then we work out how best to deliver it"
Exodus had started life in 1974, running overland truck tours on “the hippie trail” from the UK to Kathmandu. 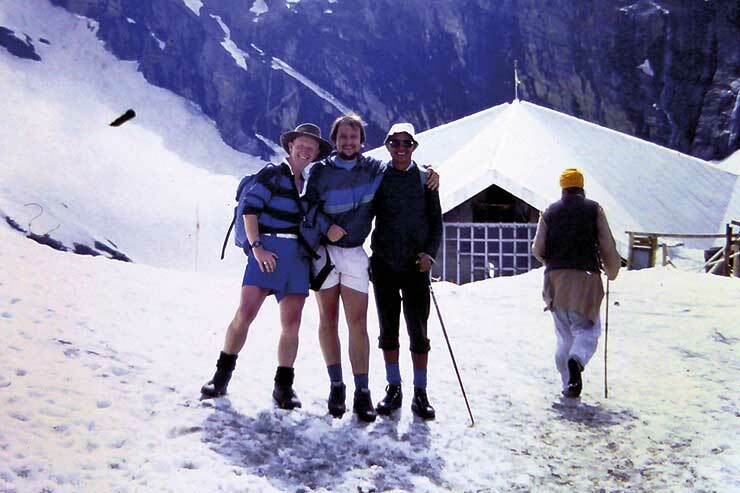 In the late 70s, it widened its programme to offer trekking in the Himalaya, then other iconic mountain regions. By the time Burrell joined Exodus in 1988, it had built up a global walking programm. And running the reservations and flights department, and later the product team, gave Burrell the opportunity to get his regular mountain fix, by guiding a trek or two in destinations including Nepal, Bhutan, Pakistan and Russia each year. The last 20 years have seen Exodus evolve further, to offer lighter-grade walking, plus cycling tours, family-friendly adventures, wildlife-focussed trips, and tailor-made and self-guided itineraries. Burrell has been managing director for the last 10 years, and seen Exodus become a significant player in the adventure market. Today, it has an Atol license to carry 22,550 passengers, while land-only sales account for a further 40% of business. Its worldwide programme now comprises 500 itineraries in 90 countries. “Beside, there’s so much business out there; so many people wanting to do something different on their holiday,” he adds. “That’s the sort of smaller agent Dan [Jackson, agency sales manager] and the team will go to see, and support with collateral and doing local shows,” he explains. “We’d like to do more. Helping agents understand and sell our products is something the whole adventure sector needs to get better at. But the opportunity for agents is huge; it might just be a week walking in Andalucia at first but that client might come back and pay £10,000 for a trip to Spitsbergen." The other challenge for adventure operators is encouraging mainstream holidaymakers to try adventure for the first time. "We need to tempt them away from their typical fly-and-flop in the Mediterranean to try something new. We get an awful lot who try it and then never look back," he reports. Online agency responsibletravel.com is another key partner for Exodus, which is reflective of the operator's huge focus on caring for the communities and environments in which it operates. A wide range of projects in core destinations have included building a hammam in a remote Moroccan village so local people can keep clean; installing smokeless stoves in Nepal to minimise damage to health; and funding education campaigns in Kenya to help stamp out female genital mutilation. One of the best parts of being managing director has been the freedom to focus on responsible tourism, Burrell says. "I'm sure some of the team get a bit fed up of me constantly banging the drum, but I believe passionately that tourism can bring a lot of good to remote countries and regions." Keen to do something with a wider, less-localised impact, last year Exodus launched a new initiative to take children on day trips to enjoy the cultural and natural beauty of their own countries. "The only way we can preserve the amazing wildlife, cultures and places in the world is by helping local people see the value of those things and appreciate them themselves," Burrell explains. A total of 2,347 children saw places like the Taj Mahal, Petra and Angkor Wat for the first time in their lives. "When we saw the reaction of Masaii children seeing their very first elephant, we were all in tears," he recalls. "The kids said they understood for the first time what everyone makes the fuss about." Exodus won the Responsible Travel award at the Adventure Travel Awards last month for the project – on the same night Burrell was honoured with the Contribution to the Industry award. Exodus's community-focus took Burrell back to his beloved Himalaya in May 2015, though in tragic circumstances, following the earthquake which killed 9,000 and left hundreds of thousand homeless. Exodus clients donated more than £275,000 – "We'd hoped for about £15,000" – and Burrell and colleagues went to Kathmandu to buy supplies and take them into the mountains to remote villages, which had often been visited by no other aid services. "Because of our strength on the ground, with access to tents and vehicles and porters, we were able to get things done. Thanks to the outpouring of love from our clients, we were able create this amazing momentum. It's probably my proudest moment in 30 years at Exodus," he recalls. Those 30 years have had other challenges, from a business point of view. Exodus's founders sold the business to Tui in 2002 when Tui's then-boss Peter Long was building a portfolio of adventure and activity brands. In 2011, Tui launched a joint venture called Peak Adventure Travel Group with Intrepid Travel, with a view to making efficiencies. But the Peak partnership was wound up in 2015, and last year Tui sold almost all of its specialist brands to a private equity firm, which formed Travelopia. "There have been difficult times,” Burrell admits. “We’ve had a few more changes of ownership than I'd have liked, but we learnt from it. And through it all, we’ve succeeded in increasing market share." The operator starts 2018 in a strong position, he says, with sales in January matching January 2017, which was the best sales month in the company's history. "We got a lot of things together after our split with Peak," he explains (not least, one suspects, the £1 million annual management fee it had been paying to Peak, according to accounts on Companies House). Exodus begins a new chapter in its history this month, with Sam Seward joining the company as managing director. Previously managing director of Gullivers Sports Travel - another Travelopia brand - Seward will bring new commercial and digital experience to the business, according to Burrell. "It will do us good to have someone from outside the adventure sector to come in with new ideas," he suggests. "But what we do share is a real passion what we do. He set up his own sports travel firm as he's a mad keen rugby player. That passion will make him a very good fit," he added. Burrell himself will remain in an advisory role for a few months while Seward settles in, and then move to Devon, where he may or may not fully retire. "Devon, on the edge of Dartmoor, is one of the few places in England where I can go and pretend it’s the Himalaya," he laughs. "Knowing me, I could well end up guiding walks there!" And how would Burrell like to be remembered by the team he's steered for the last decade? "I hope that guiding is how I've been able to run the company too," he suggests. "Not directing, not dictating. There is a team of very intelligent, very capable people here, and all I've tried to do is offer support when it’s needed - and steer them onto the right path every once in a while."